Boasting a catalogue that includes a full Balinese gamelan, the wonderful Array Mbira, a set of glass instruments and a Cumbrian lithophone (basically, a piano designed by a caveman), UK samplists Soniccouture revel in exotic tuned percussion. Their latest offering in this vein is Grand Marimba, a deep-sampled exploration of the instrument that first emerged in symphonic works in the mid-20th century and is now an established fixture in left-field pop, as well as orchestral pieces. 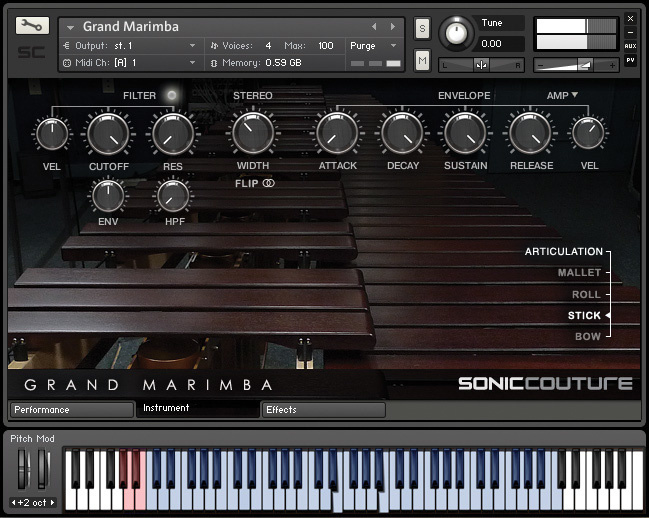 It's a relief to discover that the product name refers not to its price tag, but to the size of the instrument: nearly three metres wide and spanning five octaves, this Yamaha 6100 concert marimba is huge. The producers did a good job of capturing its wide-angle sound while maintaining a close-up listening perspective; you can narrow the stereo image if you wish, but I relished the instrument's panoramic spread. I also like the intimacy of the dry-ish studio acoustic, which can be transformed into a sumptuous concert-hall ambience by turning on the pro-quality convolution reverb. 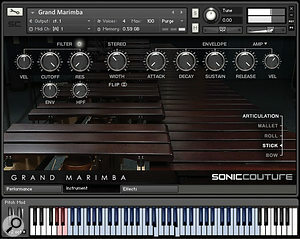 Tonally, the marimba is magnificent. Made of resonant Honduran rosewood and tuned to perfection, its bars have a fabulously ripe, exotic, woody chime and a generous sustain. Each note has 15 velocity layers, ensuring a smooth ride from soft, caressing, quiet strokes to the forceful 'knock' of the loudest hits. Given such a deep, sensitive dynamic response, you may find it helpful (as I did) to adjust your MIDI keyboard's velocity curve in order to 'tune in' to the marimba's timbral sweet spot. Rather than sampling the instrument several times over with different mallets, percussionist Greg Samek used softer mallets at the low end and graduated to a harder type in the high register. This all-in-one approach works well, providing a balanced timbre across the range. An alternative 'Sticks' articulation uses the mallet's wooden handle as the striking end, creating a unique sound like a cross between a bamboo-tube xylophone and a kalimba. Bowed samples — a Soniccouture speciality — work well for subdued, mournful, pipe-organ-like chord pads, although their upper range is curtailed (the thick, short bars of the top two octaves stubbornly refused to emit a usable note when bowed!). In addition, softly-played, looped single-note rolls evoke a laid-back, sunny Caribbean atmosphere, while an ingenious script produces realistic tremolos between pairs of notes. The sound-design section contains some gems: there's an interesting polyrhythmic arpeggiator patch called 'Auto Reich' (manna for math rock fans), and the pulsing 'Jammer Filter Thing' is an inspiration for groove-building. Open Kontakt's editor and you can tweak these patterns to your heart's content.